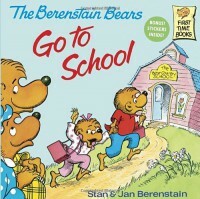 The Berenstain Bears Go to School by Stan and Jan Berenstain is a cute and relatable story on Brother and Sister Bears's fear of the first day of school. This book paints the picture of the first day of school that many readers, no matter how young or old, have painted once before. This book has an excellent message that no matter how scary something may seem, take a chance and you may be pleasantly surprised. This is such a lighthearted and warming story that is inviting for young readers who are beginning school. I would read this book on the first day of school, especially if my students are Kindergarteners. After reading this book, I would connect it to a first day of school activity that allows students to share a little something about themselves. In higher grades, this book could be connected with decoding text to find the central message or finding the traits of characters.